Aldershot Town caretaker manager Chris Barker says he is not thinking about the possibility of having the job full-time at the moment. 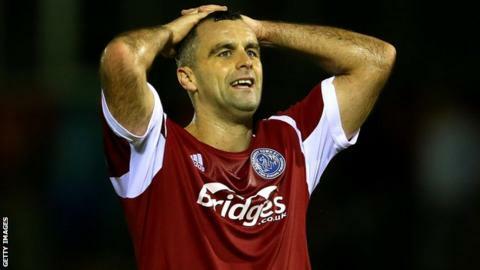 The 34-year-old defender was placed in temporary charge after boss Andy Scott and his assistant Terry Bullivant were sacked on Wednesday. "It is not about me - it is about what is best for the club," Barker told BBC Surrey. "It is a long way down the line. We'll see how it goes." Scott and Bullivant, who had been at the helm since February 2013, were relieved of first-team duties following a run of one win in nine league games. Former Barnsley, Cardiff and Southend man Barker does eventually want to move into management but, having made 21 appearances for the Shots so far this season, is currently happy to continue playing. "I know I am getting old and am coming to the end of my career but I want to carry on playing as long as possible," he said. "As I am taking my coaching badges, you realise it [retirement] will come one day. "I have got an opportunity now to prove what I can do, although for how long it is, I don't know." Barker admitted things had been "a bit chaotic" since taking charge, but he has sought advice from his older brother Richie - the former Bury, Crawley and Portsmouth manager who is now coaching at MK Dons. "I have spoken to Richie numerous times about different things, but I have to make decisions myself," he said. "We have got to take responsibility on the field. It is a new start for the club and hopefully the fans will back us."